The year is 1604. You sailed from England expecting to join a struggling colony on the coast of Virginia. Instead, you find only ghosts and mysteries. What catastrophe blighted the land and drained it of color and life? Where are the settlers and tribes who lived here? Where are the settlers and tribes who lived here? 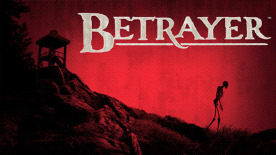 Betrayer™ © 2013-2014 Blackpowder Games, LLC. Betrayer, Blackpowder and related logos are trademarks of Blackpowder Games, LLC in the U.S. All Rights Reserved.